Born December 21, 1844 in Birmingham, Warwickshire, England. 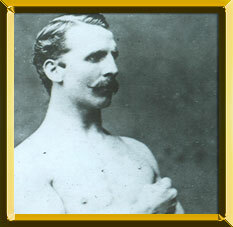 Standing 5' 5", Edwards was a standout lightweight of the late 1860s and 1870s. Edwards began boxing at the age of 14 and quickly found success. Matched with Sam Collyer on August 24, 1868 for the lightweight championship of America, Edwards registered a 34-round win for the title. Next he retained the title with a 40-round win over Collyer and drew with Tim Collins before meeting Hall of Famer Arthur Chambers on September 4, 1872. With the championship on the line, the two pugilists commenced to battle at Squirrel Island, Canada with Chambers winning on a foul in the 26th round. Edwards rebounded to score wins over William Fauceth and Collyer. He was inactive for a decade following the Collyer bout, but returned to meet Hall of Famer Charlie Mitchell in 1884, losing in the 3rd round. Following the Mitchell bout, Edwards retired from the ring but remained in boxing by training John L. Sullivan for several winning contests. During his career, Edwards reputedly defeated heavyweight Ben Hogan. Wealthy from real estate investments, he died August 13, 1907 in Brooklyn.